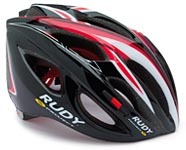 Rudy Project®, known worldwide as the cutting-edge manufacturer of cycling and triathlon helmets and eyewear, has now introduced the Slinger, the company's lightest Consumer Product Safety Commission (CPSC)-approved helmet. Premiered at Interbike and available to the public in March, the Slinger is expected to quickly position itself as a favorite of local clubs and professional athletes alike. "Based on the overwhelming positive response we received at Interbike, we are really excited about the potential impact the Slinger will have on the helmet market in 2009 and beyond," claimed Paul Craig, President and Co-Founder of Rudy Project North America. "When people came up to our booth at Interbike, I would hand them the Slinger and, every time, they had this bright-eyed amazement as they would bounce the helmet in their hands and exclaim how light it is." In a market that yearns for distinction and value, Rudy Project has positioned itself as an innovative force by creating a light and compact helmet that adheres to the most stringent safety standards and offering it at a mere $100 retail. The Slinger easily surpasses the competition in value by offering advanced features associated with a $200 helmet at half the price. Boasting enormous vents, this amazing product also includes a revolutionary new retention system. The Slinger owes its extremely lightweight, impact-resistant shell to its In-Mold construction technology and features 13 massive vents that maximize airflow and ensures continuous internal ventilation. Another hallmark of the Slinger is its RSR retention system exclusive only to Rudy Project helmets. Easy-to-use and fully adjustable, this ratchet-based retention system allows for quick, on-the-fly adjustment with only one hand. Helmet adjustments are typically done multiple times at any point through a ride or race, making this feature appealing to all athletes. The Slinger also made its competition debut at Interbike during the USA CRITS Industry Cup by two pro-level cycling teams - Inferno Racing (www.infernoracing.org, now Kenda Pro Cycling presented by Spinergy) and the Colavita / Sutter Home presented by Cooking Light women's team (http://www.teamcolavita.com). "We have always been impressed and extremely pleased with Rudy Project's products, which is why we exclusively use them during training and competition," remarked Iona Wynter Parks, Directeur Sportiff of Colavita. "When we got the new Slinger, the whole team was really blown away by how light it is and even more pleased once we raced in them in Las Vegas. It is easily the lightest and most comfortable helmet we have ever used." Rudy Project has a long history producing helmets for some of the world's top cyclists, triathletes and in-line speed skaters, including the first full-face time trial helmet that helped legendary World, Olympic and Tour de France Champion, Miguel Indurain, as he set the hour record in 1994. Rudy Project's new Slinger proves the company is continuing their performance innovation by taking helmet technology into a new direction, while promising to be an emerging market leader with more helmet releases to come. The new Slinger comes in sizes S-M and L and in colors White-Silver (shown), White-Blue-Red, Black-Red-White, White-Gold-Black and White-Pink-Silver. and "Timeless Design Award" (Ketyum frame/Syton Supercomp TT Helmet). Rudy Project eyewear ranges from $140 - $350 (Helmets from $100 - $300) and is available at premier cycling and sporting goods stores and eye care professionals throughout the U.S. and abroad. With men's and women's collections and a vast range of options, from high performance sport styles to fashionable frames for everyday wear, Rudy Project has something for everyone.